Same low price of $200/team for an 8 week season. Monday, Forest Hill P.S., Kitchener (8:30/9:30). Starts April 15th, 2019 (room for 1 more team). Wednesday, Forest Hill P.S., Kitchener (8:15/9:15). Starts May 1st, 2019 (room for two more teams). Individual “free agents” (or pairs) who would like to play in the Wednesday league can join for free! 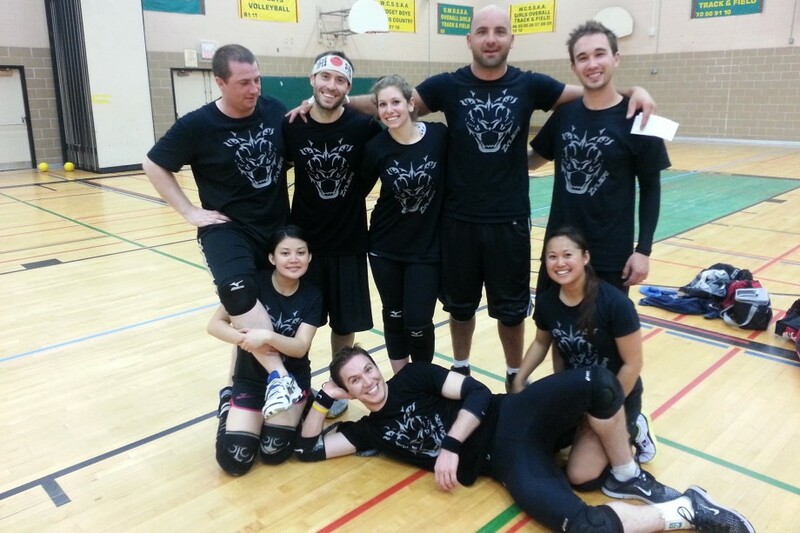 Our team played last fall/ winter and it was a blast! I have the same team again this fall and winter season and looking forward to play again. Please let me know the best way for me to send the money for the team registration. Hi there. my husband and I just moved to Waterloo. He misses his dodgeball league back home A LOT! Is there any way he can join on someones team? We don’t know enough people for him to put in his own team. Thanks! Hi Lindsay! Definitely. Which league would he like to join? (see options above). Any idea how the Cambridge league is shaping up? How many teams so far? So far 2 teams have signed up. It’s hard to tell at this early point whether enough teams will sign up to make a league there. If I want to make a team but currently only have three players, is there away for people who don’t have a team to be added to mine? I want to join a Wednesday night leaque at Macgregor or Laurenwood. Anne – I can definitely team a Weds team for you and your friends. If you can leave me your email address (you can message me via email using the “Contact” page), then I will take care of that. Mike – Sorry I missed your comment earlier. Thanks for letting me know about their being an established Cambridge league on Tues already. I will see about a Mon or Weds Cambridge league for the Winter. My 8-year-old son is crazy about dodgeball. Is this league for adults only? If yes, would you recommend a place for him to play? Hi Noah, Not seeing a link but Ballzinga would like back on Wed nights at FH please. Hi Susan, Sorry for the delay – the Registration Form is now up! Please sign up when you get the chance – I use the Registration Form to organize everything. My wife and I are looking to join a team, does anyone need extra players? Hello, I am looking to join a team for the winter 2017 session. I play in a league here in Québec city and I believe we have the same rules. I would be open to playing at Forrest Hill or MacGregor. What is the average age range of this league? Hi Denise! Average age is probably late twenties with most teams in their 20s or 30s. Hi noah, the registration said there would be a confirmation within 48 hrs and i have yet to hear back. Is there still room on Mondays? Hi, i just noticed the registration closed yesterday, is there still room? Hi Mike,yes there is still room. Please use the registration form and I’ll get right back to you! My friend and I were hoping to be on the same team. Is there a way for 2 individuals to be on the same team? I hope there’s still room left!! For sure, you can indicate that on the registration form in the link above. My brother and I would like to be on the same team for the Monday league. Will you put us on a team or how do we know what team we’re on? First time signing up… hoping we’re not too late!! My brother (Muhammad Khan) and I (Sadaf Saeed) just registered as individuals. Hoping to be on the same team for the Monday league. Hi Sadaf, Thanks for signing up! I’ll do my best to find a team for you and your brother on Monday nights. I’ll contact you in about a week to let you know. I’m just wondering if there’s any teams that could use a female player. I work shift work so I do two weeks of afternoons. So I would only be able to play two weeks out of the month while I’m on my day shift. That’s great! The deadline is January 9th. Let me know how things go.